On Monday, May 14th, 2018, Sasha Cohen, Olympic Silver Medalist and Star Mountain Charitable Foundation (SMCF) Advisor delivered the Commencement Speech for the School of General Studies at Columbia University. Sasha is a 2016 Alumni from Columbia, holding a Bachelors degree in Political Science. She incorporated experiences from her personal life and career while giving advice to the graduating class. “I had moments of incredible joy and freedom, later replaced by heartache, doubt, and groundlessness. But that’s life, with its ups and downs. 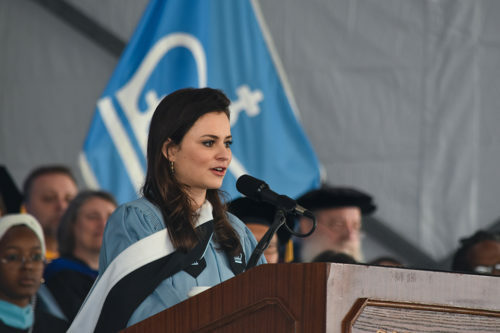 Each experience both personally and professionally has taught me something about myself and the way I want to be in this world,” -Sasha Cohen, Columbia Commencement Speech 2018. In addition to being on the board of Star Mountain Charitable Foundation, she serves on the board of the Figure Skating in Harlem organization and is involved with the American Heart Association, Make-a-Wish Foundation, Ronald McDonald House, and Orphaned Starfish. Click here to see Sasha’s full speech.